Is HTC knocking some sense into its UI? On Monday, more images of the rumored HTC M7 were uncovered, giving some the impression the phone was being primed for a debut at the 2013 Mobile World Congress. 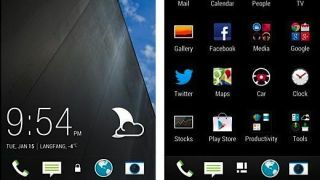 HTC hasn't exactly been able to avoid leaks in the past, and to compound matters even further, new images of the company's HTC Sense 5 have reportedly leaked. The owner of the images claimed the skin was running on a Droid DNA, using the Android 4.1.2 Jelly Bean OS. Of course, the version of HTC Sense 5 the user claimed he was using was actually ported from the yet to be released M7. Upon closer inspection, the leaked image of the HTC M7 certainly does share some similarities with those of the leaked HTC Sense 5 photos. The streamlined homescreen has the same bottom dock, though the M7 has a slightly different time/date/weather look than that seen in the HTC Sense 5 images. As for the look of Sense 5 beyond the homescreen, the limited shots provided on XDA show a much cleaner approach, which could be the influence of Android's similarly smooth stylings. This isn't likely the last HTC leak likely to break before MWC in February, so an even better glimpse at what awaits loyal HTC users could come between now and the end of next month.